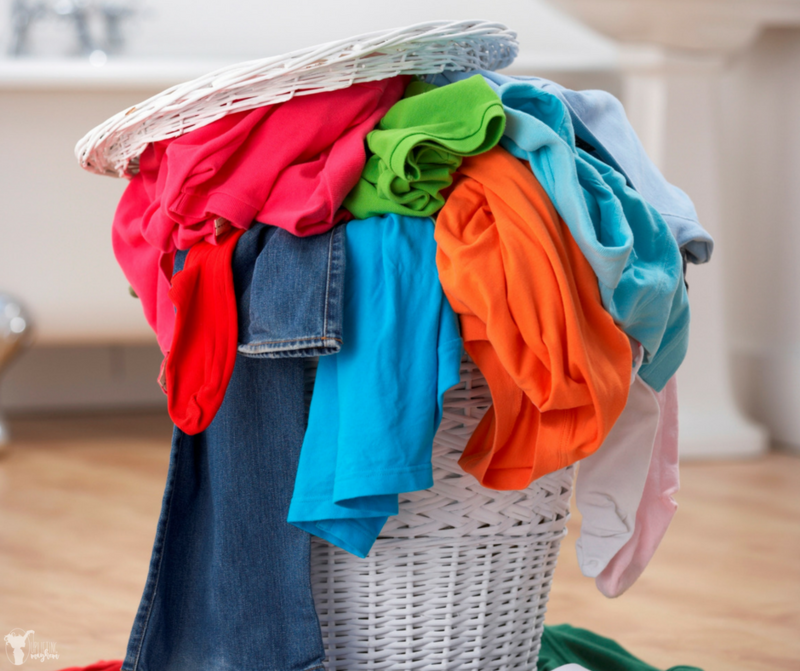 Laundry Tips to SAVE YOU TIME! Laundry, laundry, laundry! I recently returned from a 2-week vacation in Mexico, and the pile of laundry following our trip was crazy and stinky! As I turned the corner to my laundry room, I paused as I contemplated running away from the huge pile of dirtiness flowing out of the door into the hall. Endless amounts of blankets, socks, swimming suits (that were still wet), towels etc. As usual, the laundry won, knowing it wasn’t going to wash itself. 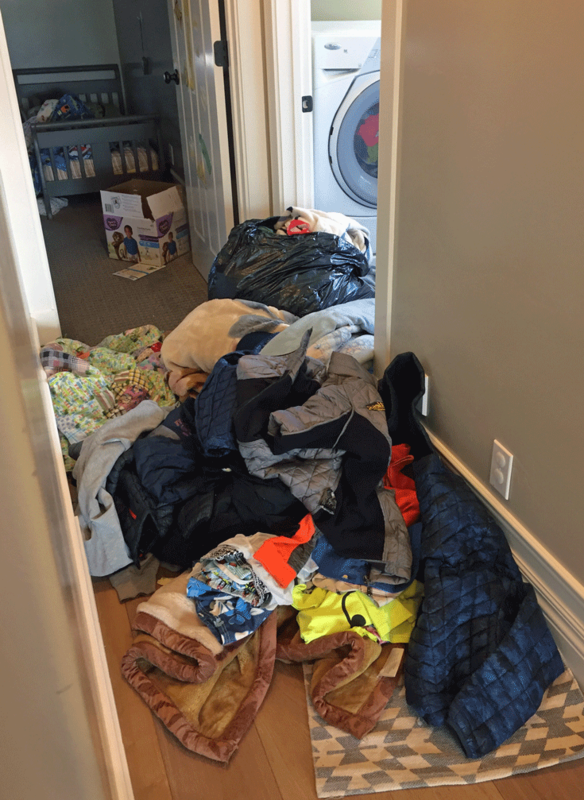 I posted the picture of my mile high laundry pile on my Facebook page and moms were soon saying words like, “Laundry is the armpit of life.” Bah ha ha!! I tend to agree, but yet it is a necessary evil in life. Having 5 boys, I have done lots of laundry, and I have tried lots of different methods to make it easier. Unfortunately, one method doesn’t work forever. Life changes, your kids grow, your laundry room set up changes and it forces you to have to try something new. 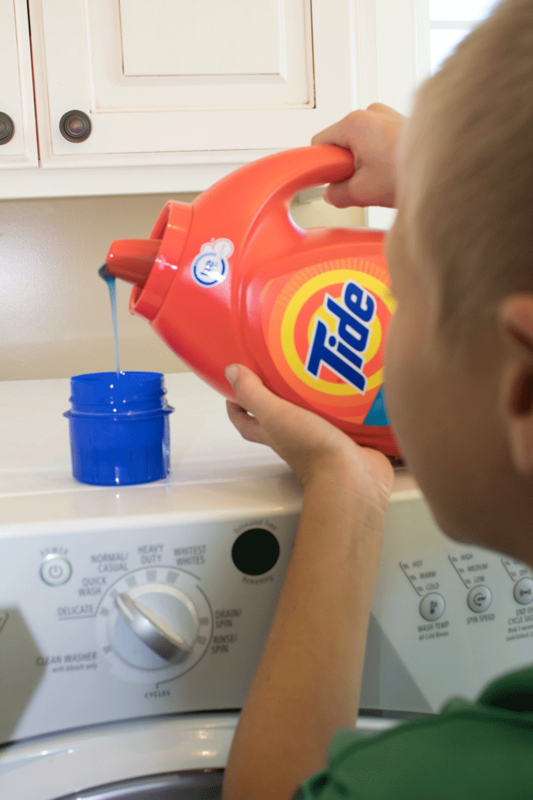 Also, as a quick little tidbit to save you some money, Tide HE 100 oz. Liquid laundry detergent is on Rollback at Walmart for $10.77 right now! YAY!! Plus there is a $2 brandSAVER coupon making it only $8.77. Go to this site to get your coupon. This coupon only works for in-store purchases until 1/13/18, so hurry! This post is going to focus on different tips that have made my life easier in the laundry room. They are in no particular order, but these tips are tried and true in our family of 5 boys! Tip #1 – Don’t fold sheets. When washing sheets, strip the bed, wash the sheets and put them right back on the bed. This eliminates the pain of folding sheets. I mean who really likes to fold fitted sheets?? Let’s face it, 80% of people just wad it up in a ball anyways. Problem solved, just put it right back on the bed. 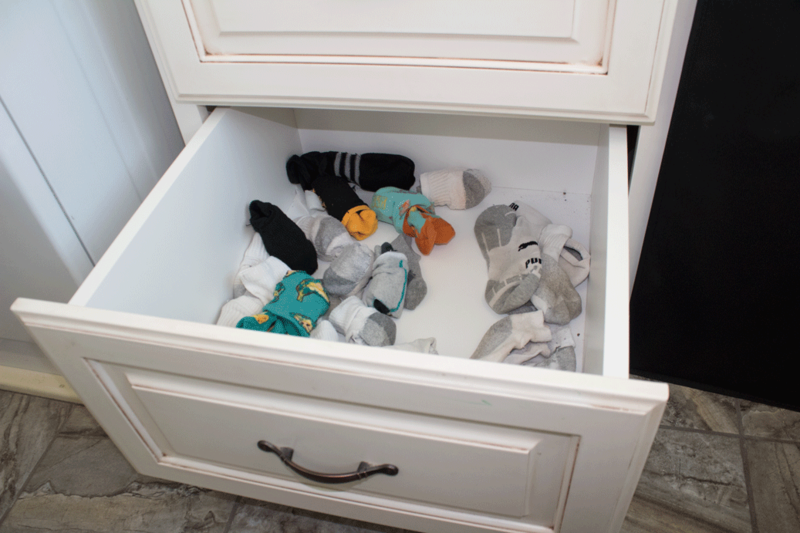 Tip #2 – Leave all socks in the laundry room. Matching socks is a job that may or may not get done. I have found this tip to save me lots of time. If I can get two matching, great. If not…..that’s ok too. Early on I realized my boys would never get socks on first thing in the morning. We would be rushing out the door and they would have to run up to their room and get socks. I decided to keep the socks in the laundry room and it has been amazing! I have a basket with them in it. Sometimes they are matched, and sometimes they are not. If they aren’t, my boys grab two that match (or not) and they are on their way! This is a great job for a young child to do. They usually love finding the matches as well. When I’m in the laundry room working on something, I have my 4-5 year olds in there finding socks that match. They think it is way fun! Lights, whites, darks……..as far as my kids clothes, I do not follow this 100% of the time. I rarely have had my boys’ white shirts ruined because of mixing clothes together in the laundry. I wash them all together if they have a similar texture, which for my boys, is 98% of their clothes. Fortunately (or unfortunately, however you want to see it HA HA) I don’t have cute, frilly, girl clothes. If you do, I would wash these separate than other everyday clothes to keep them looking nicer longer. My boys, however, live in sport pants, shorts and t-shirts. I do wash their white Sunday shirts separately, but really that is it. (This is just for my kids clothes. My husband’s and mine are different and are washed separately from our boys’). Tip #4 – If possible, hang up your child’s shirts. Asking your young child to fold their shirts is a stress I don’t want to have. Let’s face it, the first day they go to pick out a shirt, the remaining shirts will become a mess anyways! Having their shirts hung up allows them to see their selection and pick one shirt while leaving the rest undisturbed. Also, hanging up a shirt is a lot easier for a 5-year-old to do than folding. Tip #5 – If your child is 5 or older, don’t fold their clothes. What?? You might ask! Seriously, this will save you hours! Simply wash, dry and sort back into a basket. Teach your child how to put their clothes away. This takes time at first, but eventually they will be able to do it by themselves. If they aren’t perfect, who cares. If you follow tip #4, your shirts will be hung up anyways, allowing them to straighten up more. I fold my baby’s clothes and place them in drawers because I know they will stay that way. When my toddler starts to show interest in picking out their clothes, I start hanging up their shirts. This allows them to choose without you going cray cray because they have to look at every shirt first by unfolding each one. 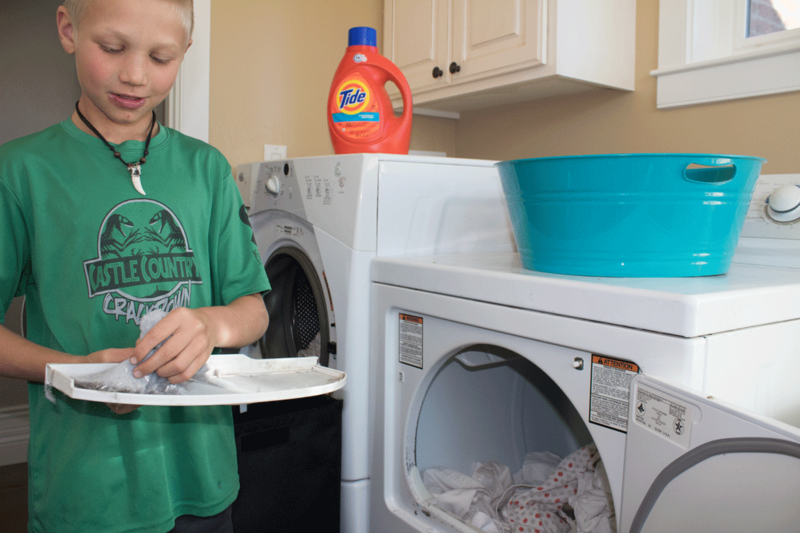 Tip #6 – If your child can play a game on your phone, they can operate a washing machine. Ok, we have all heard this tip, and it might be a little dramatic, because most 2-year-olds can play games on a phone. Basically it’s just meaning that laundry isn’t hard. Start them young! I always begin with my young kids coming and helping me load the washer, add the soap, and push the buttons to start the washer. They love it, and it only takes a few short minutes. When it is time to rotate, they help me transfer the clothes to the dryer (front loaders make this a little easier). My 2-year-old loves doing this. They clean the lint catcher next and add a dryer sheet! I don’t know what it is about the lint catcher, but it is something my boys love doing, they think it is the coolest thing! I then teach them how to start the dryer and VOILA, they learn by doing! Tip #7 – Run water through your lint catcher. I heard this tip somewhere long ago and it helps my dryer run better. Really! Try it. Clean out your lint catcher and then run water on it. At first the water doesn’t go through very well. Rub it with your fingers until the water goes through without any problems. I don’t do this every time, just every once in a while. 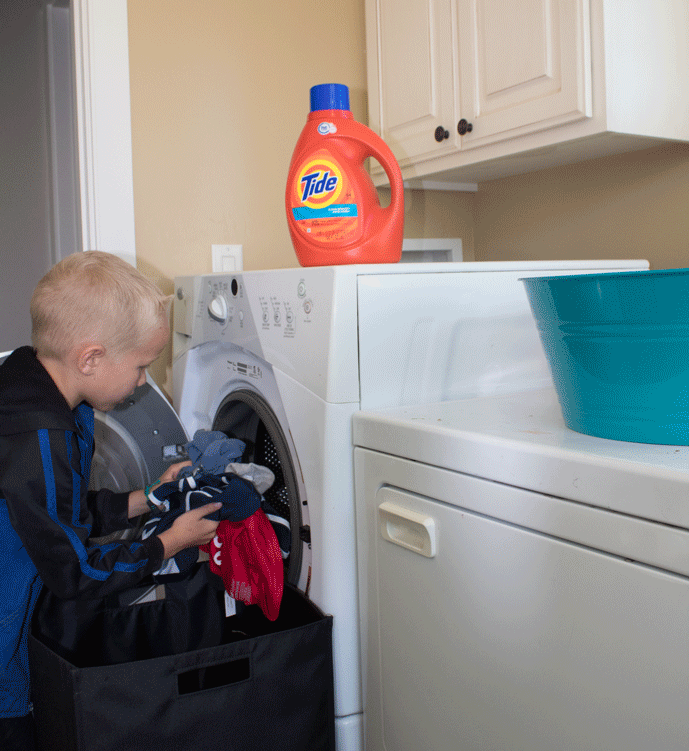 Tip #8 – Have each child in charge of their own laundry. I have 11, 9, 7, 5 and 3-year-olds and this works for my 3 oldest boys. 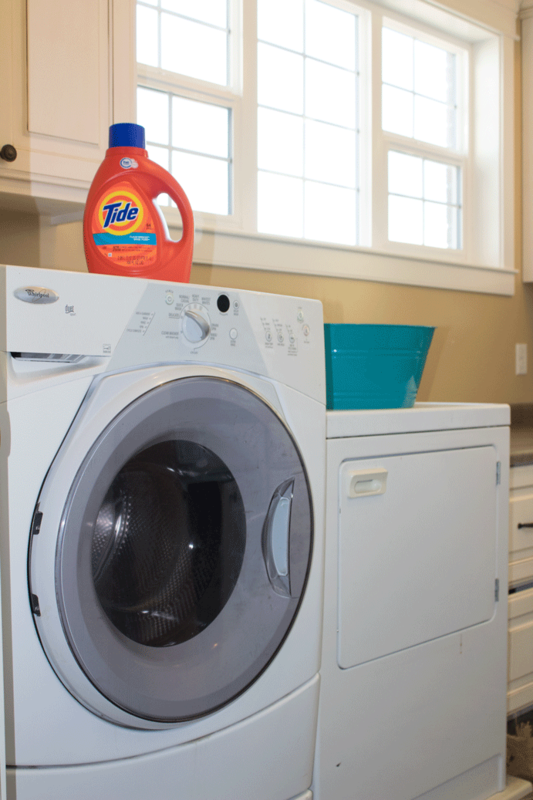 Each week we pick a day and focus on laundry. I choose one child to start it off. They get their laundry basket that only has their clothes in it from their room. They then go through the process of putting them in the washer, adding soap, and starting it. Once the washer is done, he goes and changes his clothes over to the dryer. The next child does the same thing and follows the above steps again. Once the clothes are dry, they throw them all back in their basket and they immediately go and put them away. All of this is done with minimal help from you. It is fabulous! If it is a small load, you can have them wash their sheets or coat as well. This method works because my boys’ clothes are all similar texture as described in tip #3. My 5-year-old could wash his clothes by himself, but I combine my 2 youngest’s clothes together since they are so small. Tip #9 – Downsize the amount of clothes your child has. What kid needs 30 shirts??? Mine did….until I got rid of half of them. Every week during laundry time, I always wondered how many clothes were being washed that were actually clean. Whether it is a shirt they didn’t want to wear or one that was dropped, we found we were washing clean clothes, or clothes they never wore. I decided to purge their clothes. I let them keep 12 shirts with some long sleeved and nicer shirts.They kept 5 pants and 7 shorts. I taught them to wear their pants and jammies more than once. I can tell you that this has decreased the amount of clothes washed each week. Here is post on organizing your kids’ clothes and downsizing! Tip #10 – MOMs… Work yourself out of a job! A wise mother told me this once, and I have thought a lot about it. Our job as mothers is to teach our children how to maintain a home, which ultimately works ourselves out of a job. It’s genius, really! Laundry is a huge part of this. We are doing our kids a huge injustice by doing everything for them. You don’t have to be super mom, in fact you shouldn’t be super mom. Teach your children to do it themselves, so they are confident when they leave your home and face the big wide world! They will thank you some day! Pin this image to share with your friends or to use for later.